For many, in the cold and frozen Northern Hemisphere, this heading, and the blog may be a "warm greeting" from me. I put forward a blog of a "Heat Wave". Yes, a "Heat Wave" with tempearutures 6c above normal in Mumbai Colaba. In fact, all along the west coast of India on 16th, we see, in the map attached, a series of day temperatures in the 34/35c range, with a top of 35.5c at Ratnagiri. The IMD colour map shows the west coast getting warmed up. Incidently, 35.5c at Ratnagiri befits the "heat Wave" title, as it turned out to be the highest day temperature in the entire Norhtern Hemisphere yesterday, 16th. jan.
And Mumbai turned up being the second warmest city in the Hemisphere on the16th. !! Beating all traditional "hot spots". It is too unusual for Mumbai (Colaba) though. Last year, 2009, too recorded a high of 36.3 on 24th. January. And, it was 36.2 on 31st. Jan in 2007 also. Mumbai is a contrasting and Topsy Turvy city, temperature wise. The normal high for the peak summer, in May is 33c. And here we record a day warmer than a normal summer day. On Jan 16th, in peak winter, the thermometer reads 35c!! But, in May, with the temperature at 33c, and a strong westerly breeze, the humidity would be 80-85%. Making it extremely uncomfortable. While now, in January, with dry easterlies blowing the high to 35c, the humidity is 30-35%. 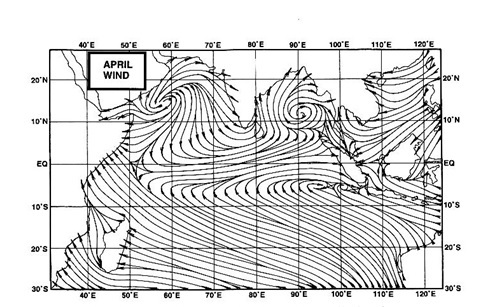 The highest ever for Mumbai (Colaba) for Jan was 37.0 in 1991, and for Mumbai Santa Cruz it was 37.4 on 16th. Jan 2006. Will it touch the all time high this year ?? Well, with 1.5c behind, seems a bit difficult. But, if the easterlies which are the reason behind the coastal heat, do continue for a couple of days more, it can touch 36c, at the most. And, I do not see the winds veering back to the northerly direction till Tuesday. Mumbai has not seen much of its normal temperatures this year. As the diagram of the previous 30 days shows, much of the period is in the "red". And only on a few days it has gone into the :blue". Now in comparison, the North India belt for the period, is another extreme.The region has been reeling under cold day conditions the last 25 days. Take a similar diagram for Delhi, and in sharp contrast, we see a major portion in blue, mainly due to the below normal days, below by as much as 11c in places.